Wedding makeup is not as easy as it looks like. This is actually one of the most difficult, not to mention demanding makeup, a makeup artist will ever encounter. 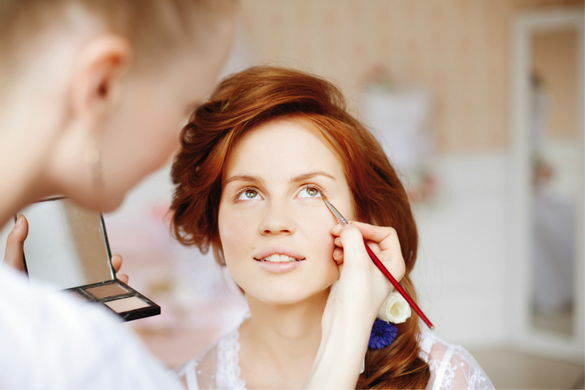 Learn how to create a perfect and beautiful bridal makeup with these helpful makeup tips. A wedding will not be complete without pictures. Expect tons of pictures to be taken so make sure that the bride's and groom's makeup is not only flawless but photogenic as well. To make the bride's lips more obvious in pictures, top her lipstick with a gloss. Sparkly makeup looks beautiful in person but avoid using too much glittery powders as they will show up as ugly white specks in photographs. Remember, sparkly makeup is also a no-no makeup for mature women. It will just end up emphasizing their wrinkles. Don't forget to apply the blush --- a hint of color on the cheeks always looks good in pictures. Wedding celebrations may last all day long so make sure that the makeup will not disappear or fade before the wedding celebration ends. Applying a makeup primer is a must if you want to achieve a long-lasting makeup. Makeup primers are known to absorb oil --- allowing the makeup to look fresh all day long. Setting the foundation with a finishing powder helps the makeup stay on all day. Loose powders with oil-absorbing minerals work best in setting the makeup. To make the lipstick last longer, apply a thin layer of powder on the lips first before applying the lipstick. Blot gently the first layer of lipstick then apply the second layer of lipstick. Do this until the desired shade of lipstick is achieved. Sweat and tears are always anticipated on weddings. A tearful bride is not an unusual sight during wedding ceremonies so make sure that the makeup you'll be using on the bride is waterproof like waterproof mascara and eyeliner. Make sure that your eyeliner is smudge proof too. We don't want the bride to have some hideous raccoon eyes on her very special day.